Hi, My name is Fritz that is short for Snicklefritz. I'm 9 weeks old and a Parti Boy Schnauzer. My birth mom had 4 pups in the litter. A liver, straight black, Salt and Pepper, and of course me Parti Boy. My new mom had been looking for awhile for a new schnauzer. I will be their 4th schnauzer. I love playing with the chickens down by the coop, ducks, and my new friend, Basil the Cat. Chasing his tail is such great fun. I love my new home. Next week we leave for a trip in my new folks Airstream trailer. I can't wait. I'm having a great time here. Oh, I almost forgot I'm close to being potty trained too. Some days are better than others with potty training, but I'm getting the hang of it. 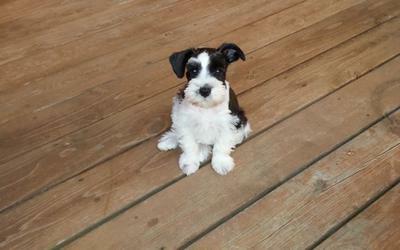 I have a female Ms. Demi Shae who is a liver party schnauzer! She is 6 lbs, a teacup and is the boss of the house! She loves to cuddle and play with her sis....Ms Mali; a liver pepper toy schnauzer! My page on here is titled:: You can't have just one Schnauzer! Fritz is very handsome, enjoy him! Schnauzers' are the very BEST! Our Little Miss Evie T (T for trouble or turbo) is 7 mos old and a parti girl. She could almost be Fritz twin aside from the age difference. She also loves traveling and is looking forward to our trip to Montana and a chance to get out of the desert heat here in Az. I did a story on her several weeks ago. Safe travels!